We’ll add “realistic volume” in your project! Among st the tasks of the modern architect is development of the construction part of the future building. The figures, drawings, and calculations and understandable to people with engineering education. How to make your project closer to a potential customer, to present your work to a large group of investors, to bring it for public discussion or just to see and to “percept” your brainchild? In this, the three-dimensional visualization obviously helps. What is visualization for an architect? Creation of the photorealistic image of even non-existent object makes the work with it much easier at the design stage. Flat drawings on paper or in computer-aided design systems, with many footnotes and slices may confuse even the most experienced designer. We offer to translate your project into the language of specific and clear visual objects, where each idea will be implemented in three-dimensional forms with realistic characteristics. Such a material can be handled by a large group of people that extends the range of experts involved in the project simultaneously. What is rendering to our studio? Visualization is the process of creating images on the screen or paper and this is a fascinating pastime for the processing of drawings, diagrams and forming a coherent picture on their basis. 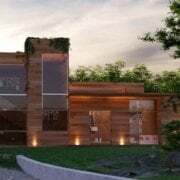 The initial data is all achievements under the project: main types, sections, drawings of floors and elements of the building, site layout and landscape arrangement. More information we receive from you, more accurate “informational reality” will be. Profession of architect embraces many spheres of human activity in which the visualization, at least, can be useful and even necessary! • The architect-city planner by means of visualization of future buildings may understand the expediency of the construction of a new clinic or administrative building in a High-tech style, for example, and at some cases – ethical relevance of monument or sculpture ensemble. • The architect-restorer can compare own views on the restoration of the architectural monument with a connoisseur of history and, maybe, even with an eyewitness of this particular construction before its destruction. • The architect-teacher will be able to reveal to his or her students information about a variety of technical solutions, detailing them with the necessary accuracy. • Visualization allows to create informative objects for an expert review by the supervisory authorities that monitor construction. Architectural Visualization = dynamics, realistic, informative value! • Modeling the construction with the correct geometry of the building and surrounding site. At this stage, all objects will be endowed with the visual properties of real physical objects (glass would refract light, and the walls will be painted in the specified color). Sources of lighting will be assigned and points to view the projection will be defined. • All constructional elements will possess the relief according to the design data. Texturing stage processes all objects so they’ll receive realistic appearance thanks to small details on their surfaces, imitating physically existing materials. • Stage of light setting allows to model the appearance of the exterior premises either in dawn, evening or other hours of the day. Simulation of natural and artificial lighting of building is possible. • We will be able to “revive” your object in the virtual space, and this is not a joke. Animation tools allow to create high-quality video with moving vehicles, walking people and swaying trees under the wind. • And here is the culmination of the process – rendering! Cheers! Your object can now be seen on the computer screen, on paper or displayed on the wall by means of projector for presentation. Now the object has received a second life in the virtual space. But, in contrast to the physical one, it easily can be changed, without destruction of single wall. Now we can “try on” a new form of balconies, colors of facades and install stucco. Studio 3d Visualization Services 3D Visualization, Render and Rendering – what are these?